I woke up early to prepare and saw the moon was still high up, which was weird. Grace & I had early breakfast at 5:30am. The road is still empty & dark. As we waited for our van to pick us up, we thought that they were late only to find out that we forgot the time difference. Sg is in DST, so we are always an hour in advance. 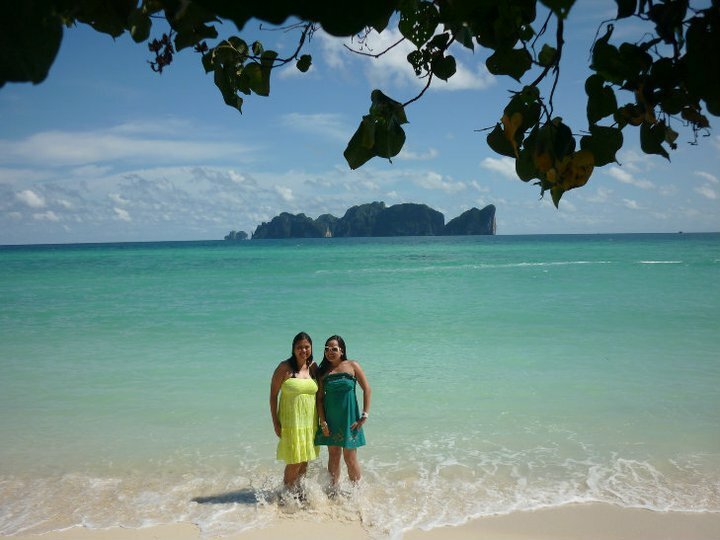 The van took us to the Rassada Pier, & from there we boarded on a fast ferry to Ko Phi Phi. It was packed with locals & foreigners. It was raining hard when we reached Ko Phi Phi. We bought some plastic ponchos at a nearby store and stood for a while at a shed along with the other travelers waiting for a boat. Due to the unfriendly weather we were all stranded there. From our research we can walk towards Long Beach, but while on our way there the locals warned us that we can not walk pass the water because it was high tide. So we decided to take refuge in a an empty restaurant beside the sea. A guy from the reastaurant helped us out to find a boat, he said we should wait for a while for the rain to stop & a taxi boat was coming. After a few minutes we prayed hard and the rain subsided and a boat came. Gracey & I are both tired and soaking wet. Two young men from SG alighted from the wooden boat and they are congenial & asked where we were from. It was my birthday, the day started out to be adventurous which wasn't a problem. We boarded the long tail boat, the problem is that the waves kept pushing the boat away from the dock making it a bit difficult to find balance. The boat ride to Paradise Resort was OK & we arrived safely It was such a relief when we reached our destination. At the resort, Pine Trees gather along the shore with cottages facing the sea. We walked along the narrow path to reach our cottage, it was new, spacious & clean. In between the cottages, there's a patio with a sculpture with water effect. After freshening up, we spent our time at the beach taking photos. 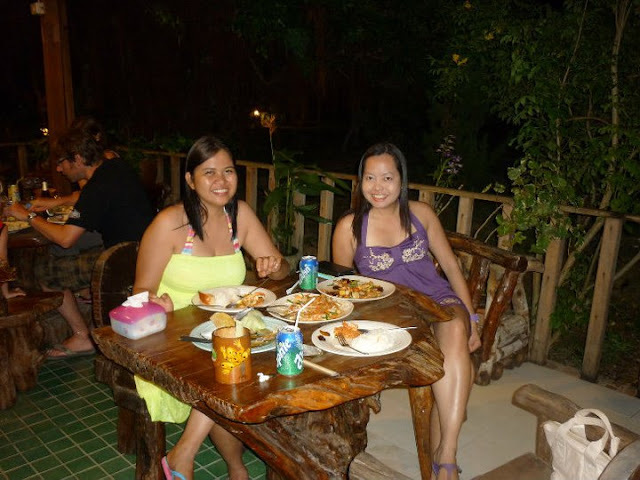 That night we had my birthday dinner at Paradise Pearl. We truly enjoyed authentic Thai cuisine. I swear their food is the best. We had Pad Thai & Chicken with Cashew. The next day, the sun showed up and a good thing for our island hopping. It totally felt like summer in the middle of the monsoon We rented a boat to take us to Phi Phi Ley. We hopped on our long tail boat. The boatman controls it with a long rod. The boatman misunderstood us & took us to the pier. I got his attention and signaled him we are on the wrong way. He transferred us to another boat. 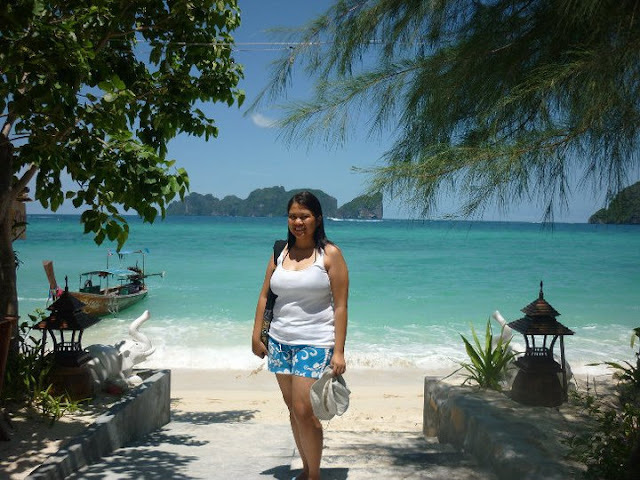 When we reached Phi Phi Lei, the first we saw is the Viking Cave, it has such big opening. Bamboos hung from everywhere. They are used as ladders to get the birds nest. Then we entered the lagoon, we passed by some really big jelly fish in a size of a basketball. The lagoon is nice with Emerald waters just like in El Nido Palawan. We went around the island to reach "The Beach"/ Maya Beach. It was really really scary, the waves are pretty strong and big. And seeing how the waves crash and shatter upon hitting the karst. Our wooden boat was no match. The boatman was able to manipulate the boat and we were able to enter the cove but we did not stay too long for it was dangerous. We were both scared because on our way back the waves are getting unfriendly and the boat was tilting. At least we arrived safely at Long Beach. The next day, we left Ko Phi Phi and went back to Phuket. The ferry was packed with Europeans, that's when I learned how Thailand banks on its tourism. The ride back was a bit rough due to the big waves & heavy rain. It was already late afternoon when we reached Phuket. We ate at Mcdonalds & bought some souvenirs. We walked to the station to catch the bus going to the airport & learned that it already left. So we rushed to find a bank to change some dollars to Bhat for taxi. It was hard to find a taxi there, a man offered to take us to the airport & we took it. We arrived safely at the airport & was able to board our plane to Singapore.